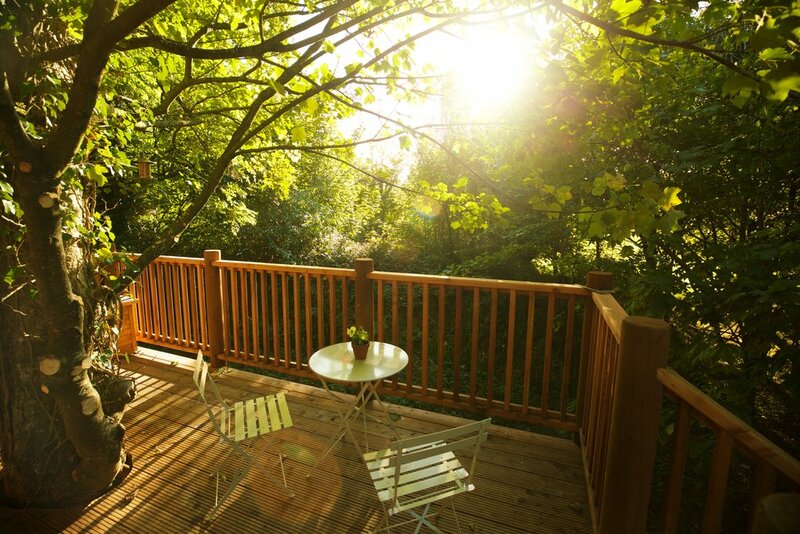 The Hideaway is nestled in our East woods with tranquil views over fields and sea to Hartland Point. A heavenly haven for you and your partner/friend awaits inside, small enough to be intimate but large enough to feel luxurious. 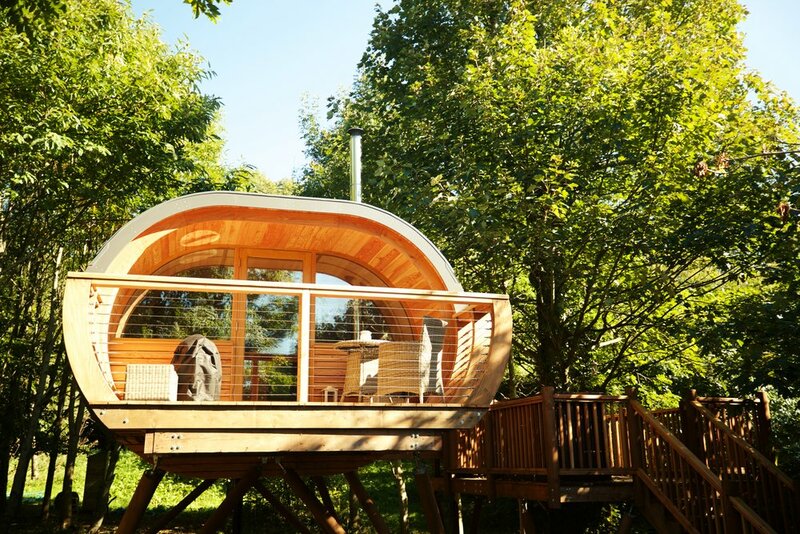 The open plan interiors are handcrafted from larch and pine, all using sustainable trees indigenous to this country. There’s a luxury king size bed from which you can see the rolling hills from your pillow. 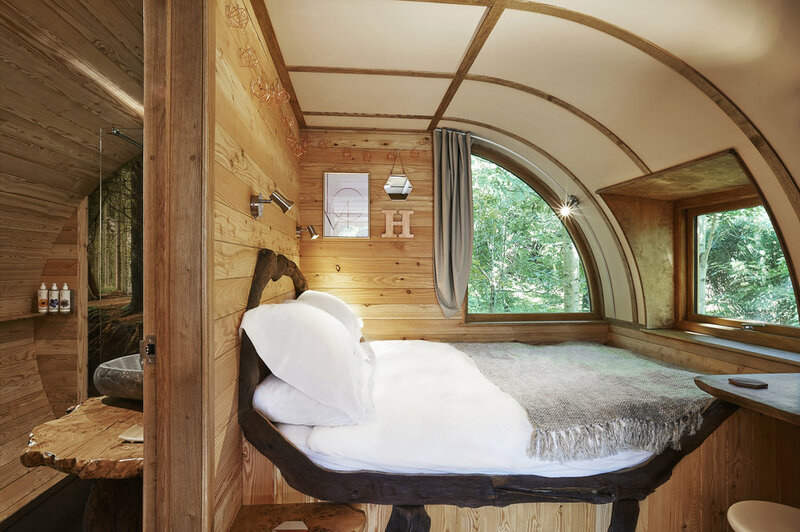 We want you to stretch out and feel at home, so there’s a full-length wardrobe with mirror, plus a proper kitchen and a living area with your very own wood burner, where you can enjoy a cosy dinner for two. There’s also a spacious en suite shower room and loo. 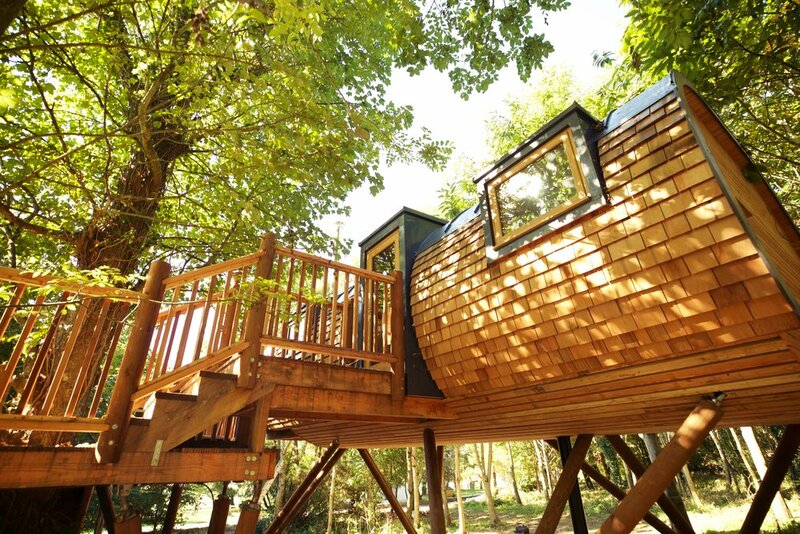 This treehouse was designed with the surrounding wood in mind. Colours reflect the hues of the bark, so visible from every window. There is even a nod to the Pickwell bees who have their home in one of the gardens nearby (don’t worry, they are not too nearby!) and produce the most clear and delicious honey nurtured from all the wildlife they discover in the environs. The hideaway is just that. 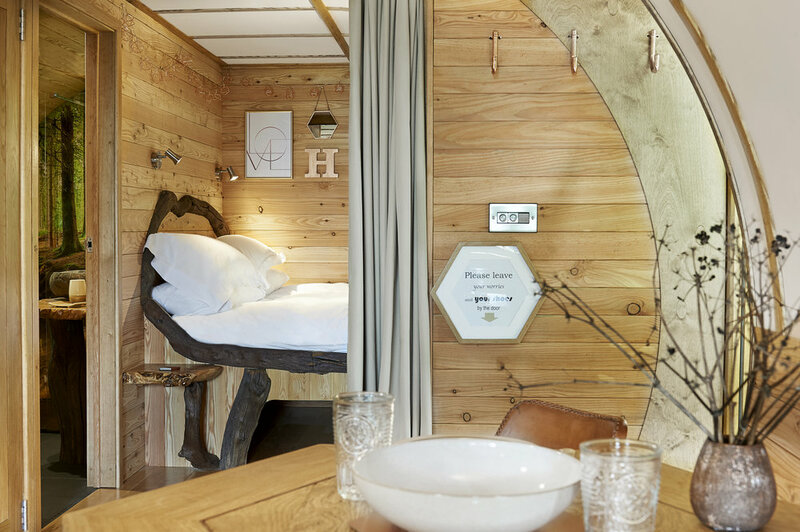 A place to hide; to hunker-down; to sleep well in the delicious big bed - find yourself again and connect with nature. Our hope is that our interior will blend with the wood around you and reflect the outside, within. 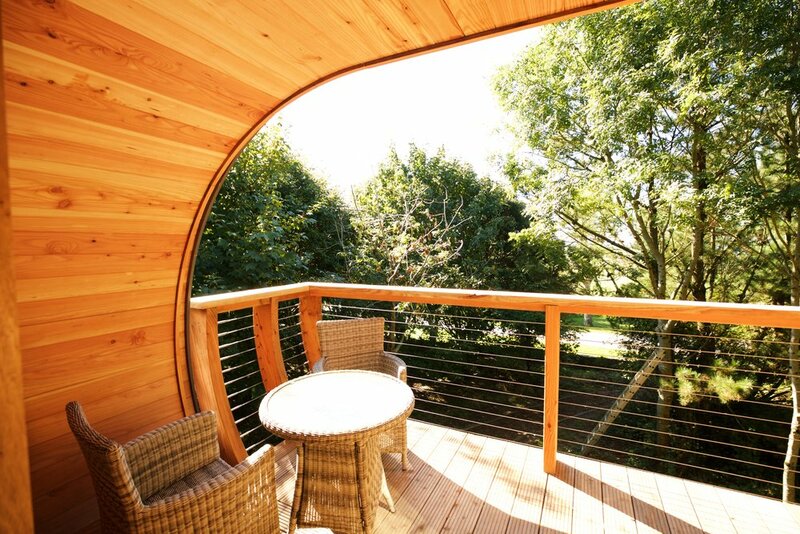 Both treehouses open out onto a large seated balcony with views down to the sea. You can sit out under the North Devon sky and enjoy simple pleasures, like the sounds of the ocean waves down on the beach below, and the sight of the dark night sky full of stars, far away from city lights. 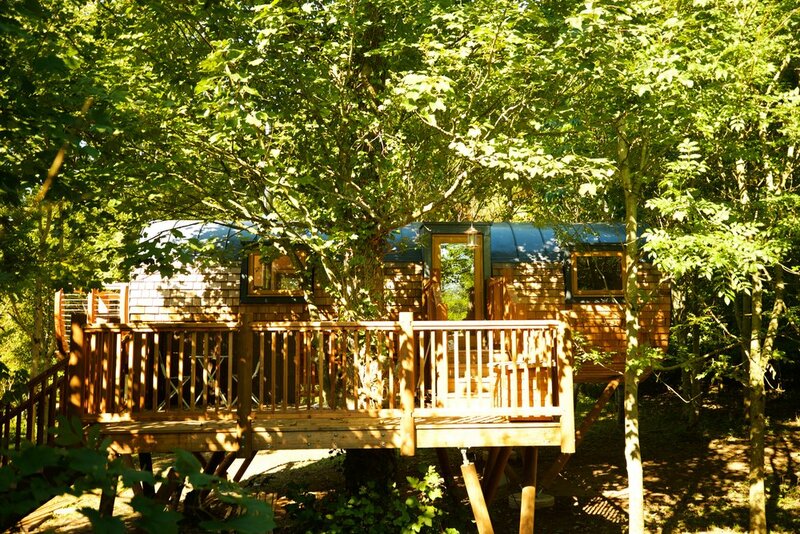 Sleeps 2 (sorry no children under 7 years old). 1 king size bed and dining seating for two. Self–catering – a beautiful hand-made kitchen containing everything you might need. A small fridge with freezer in top compartment and two–ring hob and a double oven. Private balcony area with outside furniture and BBQ. Shared terrace, garden, tennis court, surf/bike store and games room on site. 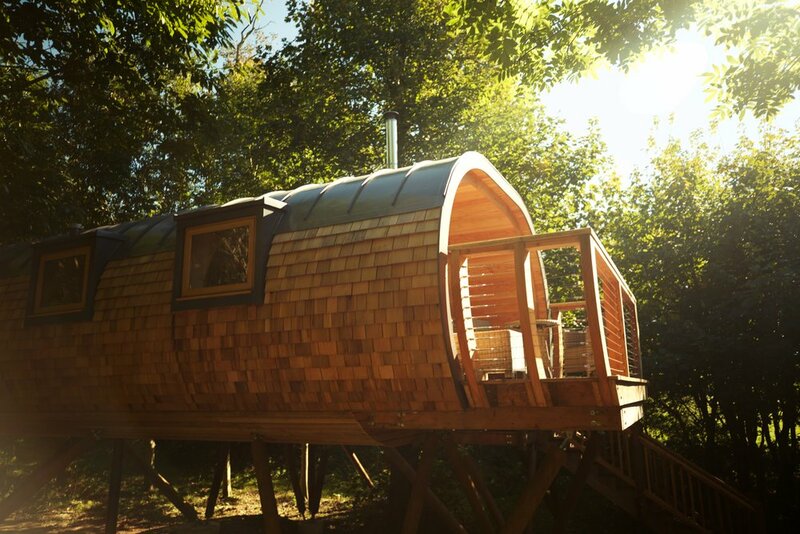 Sorry but no pets or smoking in the treehouse.